High Quality. Great price, arrived in a few short days, and it works great. We use it mostly for cold, filtered water. 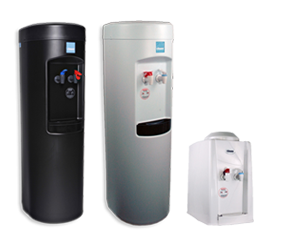 - Bobby T. Fairfax, VA.
Water Cooler Dispensers offers a full line of affordable, commercial-grade bottleless and water coolers to match any home or office needs. What is Covered by the FREE One-Year Warranty? The free one-year warranty that comes with all water cooler purchases entitles you to the replacement parts you need if the unit becomes defective during the first 12 months of use after purchase. Our technical support team is available at 866-872-5722 to help walk you through troubleshooting when problems arise or help you with installing replacement parts. If it is deemed that the unit cannot be repaired, you may be entitled to a new replacement unit. Contact us anytime to learn more if you experience a problem with your cooler and we will work with you to get it resolved as quickly as possible. Click on each link below to download the accompanying PDF file. You will need Acrobat Reader to view these files. • Is Bottleless Right For Me? • What Makes A Water Cooler Commercial Grade? • How Much Oil Is Used For Bottled Water? • Why A Home Bottleless Water Cooler? • Why Bottle-Less Water Coolers? © 2019, Water Cooler Dispensers. All rights reserved.